Home / Blog » What Is a Laminotomy? If you suffer from a medical condition such as a herniated disc, sciatica, spinal stenosis, ankylosing spondylitis, or spondylosis, your spine surgeon near Miami may recommend that you undergo a laminotomy. 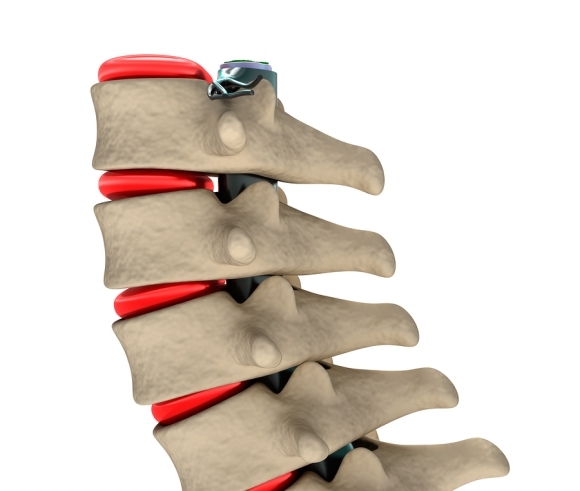 This type of back surgery is a spinal decompression procedure. During the procedure, the spine surgeon will remove a small portion of the lamina, which is the bony portion of the back of the spinal canal. The lamina serves to protect the spinal cord and spinal canal. The reason why removing the lamina can help relieve your symptoms is because doing so provides more space for the nerves. Pain and other symptoms often occur when these nerves become compressed. During a laminotomy, the spine surgeon may also remove any bone spurs that have formed in the area. The surgeon may remove part of the lamina of only one vertebra, or bone in the spine, or he or she may remove some material from multiple vertebrae. A laminotomy is often confused with a procedure known as the laminectomy. They are very similar; however, during a laminectomy, the spine surgeon removes the entire lamina.